OK. So this is an embedded version of the video hosted on the Viddler site. 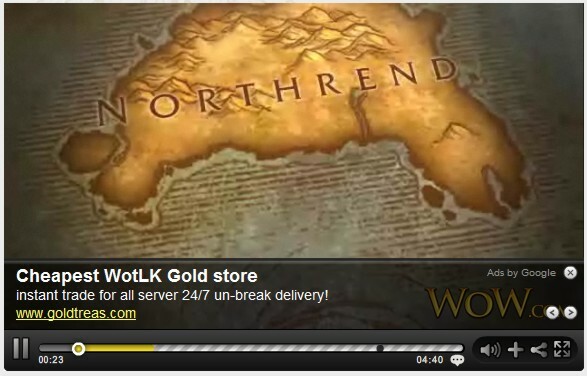 I don't know who is responsible for Google video ad — Viddler or wow.com — but I do know who is responsible for the video itself: Blizzard. I also know that Blizzard would not want to be associated with gold-selling outfits such as goldtreas.com, and indeed would be very happy to see them closed down entirely. Yet here they are, advertising on Blizzard's video because they bought a few adsense words, and Blizzard are powerless to stop them. It's not just Blizzard. When my book first came out, there were ads for gold farmers on its Amazon page and there were also ads for them that popped up for Google searches on my name. My name was being associated with a service of which I disapprove. Was there anything I could do about it? No, there wasn't. Well, I guess I could have retaliated by buying ads for their names, but there wasn't enough room to write BUY GOLD AND DECREASE YOUR SENSE OF SELF WORTH YOU LOSER LOSER LOSER in them. It's not just games. I just typed politics -conservative into Google and got three sponsored links, two of which were for the Conservative party — even though I put in a minus sign to say I explicitly did not want that term mentioned. I typed in Harry Potter and got eight sponsored links: three for books in general, one for DVDs in general, one for a new movie nothing to do with Harry Potter, one for the Wizard 101 MMO, one for Wii games in general and one for "handcrafted wooden wands". Quite how pleased J. K. Rowling would be to see her wimpy wizard's name being used to recommend Wizard 101 and wooden wands is anyone's guess, but I suspect she may be less than enthusiastic. This isn't right. People should not be able to associate themselves with someone else's intellectual property or identity without that other person's permission. If I were the manufacturer of the shoes worn by Tom Cruise, and put up an advertisement with a picture of Tom Cruise and the strapline "if you like Tom Cruise, you'll love the shoes he wears" without his permission, I could expect a swift response from his lawyer. However, if he doesn't wear the shoes I manufacture but I purchase the term "Tom Cruise" for video advertising, then every time someone watches a Tom Cruise clip there's a chance my ad for will appear but Tom won't get a penny — and people will think he wears my shoes when he doesn't.